I am a teacher at an American school in Casablanca, Morocco, where I teach English to young children. I studied at a university in Morocco last year, and am happy to be back here and to learn more about language, culture, and religion. 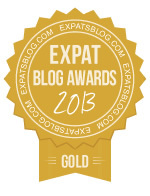 ExpatsBlog.com Expat Blog Awards 2013: Morocco Gold Award! This blog won the Gold Award for best expat blog in Morocco! A beautiful blog - nice mix of personal anecdotes and insightful observations about the culture in Morocco. Well-written and the blogger comes across as someone who is open-minded and analytical. Your Name Do you think this blog has what it takes to be listed at the top of Expats in Morocco Blogs?